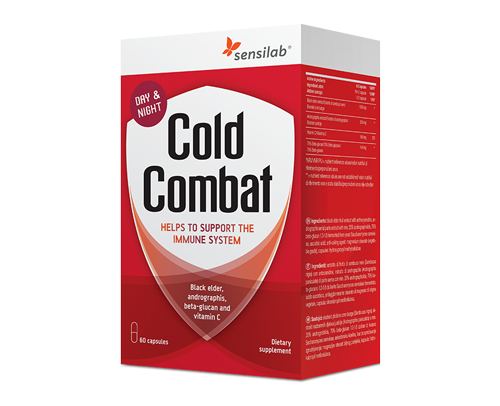 Cold Combat is designed for cold and flu prevention with a day & night effect. It contains natural ingredients for boosting the immune system: black elder, andrographis, beta-glucan and vitamin C. Herbalists have been using black elder for centuries because of its ability to combat infectious cold and flu viruses. It helps support the immune system. Andrographis commonly known as “The King of Bitters” is a herb native to Southeast Asia. It helps maintain a healthy immune system. Beta-glucans are polysaccharides that stimulate several immune system cells in our body and therefore support the immune system. Use: Recommended daily intake: 1 capsule after breakfast and 1 capsule after dinner, taken with a glass of water. Active ingredients in 2 capsules: black elder fruit extract with anthocyanidins 900 mg, andrographis extract with min. 20% andrographolide 200 mg, vitamin C 160 mg – 200% NRV, 70% beta-glucan 1.3-1.6 fermented from yeast Saccharomyces cerevisiae 140 mg.